When companies begin to spend on expansion, it’s a sign that they believe there are bright prospects in their industry for growth. In its most basic form, this is how companies invest. People invest in stocks, bonds and other assets. But companies invest by buying things like land, buildings and even other companies. And right now, the oil industry is seeing the beginning of what could be a huge phase of investment activity. 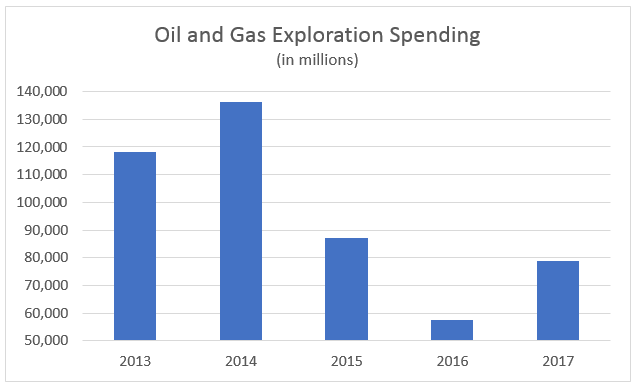 The chart above shows the amount of money that the top 53 United States oil exploration companies have spent on business investment for the past five years. After jumping 15% in 2014, spending sank by 36% in 2015 and then another 34% in 2016. The oil industry was a mess for several years due to lower oil prices and an overall bearish outlook on business. But that could all be about to change, as spending bounced back by 37% in 2017. Right now, the most sought-after thing by oil companies is land that produces shale. I had mentioned the boom in shale last month, as it’s looking more and more certain that this resource will make the United States the world’s top oil producer. It could also be a breath of life into the struggling oil economy, as companies are now looking to invest more than they have in years. Wall Street expects spending in this industry to go up again this year, as demand for shale reserves increases and larger companies expand by acquiring smaller ones. Like many things, the best way to invest in the oil spending market is through an exchange-traded fund (ETF). And one that I recommend to take advantage of this trend is the SPDR S&P Oil & Gas Exploration & Production ETF (NYSE: XOP). This ETF offers a diversified oil stock portfolio that includes every major company in the industry, and it’s much cheaper than buying a bunch of different stocks.